When reading mouse reviews or press packages for mice you’re bound to encounter some terms which can be difficult to understand if no one has explained to you what they mean. ‘Angle snapping’ is one of them. You’ve probably heard that it’s bad, but what is it exactly, and why is it bad? A modern computer mouse is an incredibly accurate piece of equipment. Compared to the trackballs of old, even a cheap office mouse can track movement with seemingly pixel perfect precision. A regular screen is made up of thousands of pixels though, and human’s aren’t inherently flawless. Ever tried to draw a straight line or a perfect circle? Unless you’ve practiced a lot it’s nearly impossible to do it freehand. The same goes for when we’re using a mouse. If you opened up Paint right now and you’d try to draw a pixel perfect straight line you’d probably fail, assuming you own a (good) gaming mouse or a mouse without angle snapping. You’d fail because of the fact that drawing a completely straight line is practically impossible for most humans on their first attempt. Angle snapping can help you with that. It ‘predicts’ (see also: mouse smoothing) when you want to make a straight line, and artificially keeps your pointer going in a straight line on the screen, even though your actual movements aren’t straight at all. 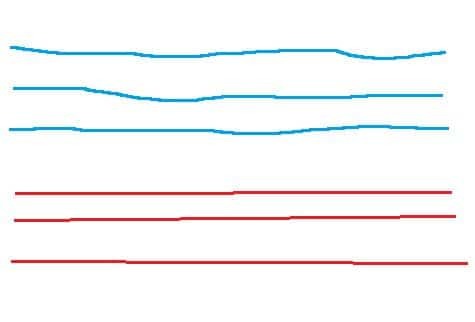 The image on the right visually explains this; the blue lines are drawn without angle snapping on, while the red lines do have angle snapping. You’ll notice that the blue lines have several irregularities in them while the red lines are mostly perfectly straight. Angle snapping can vary in intensity, depending on the mouse. Manufacturers go to great lengths in order to implement flawless sensors in their gaming mice. That’s for a reason. If you’ve got pixel perfect aim (which is something we all aspire to have) you don’t want any software interfering with the way you’re moving your mouse around. If you’re (for example) making a quick swipe to the right with your crosshairs and you encounter an enemy who suddenly pops out his head you’ll want your little micro corrections to actually get registered so that your cursor ends up on the head of said enemy. If your mouse has angle snapping it might think you’re wanting to draw a straight line, causing it to ‘correct’ your movement to form a line, thus making you miss that all-important headshot on those few pixels of enemy head you can see. On the right is a (very) crude image to explain this concept visually. 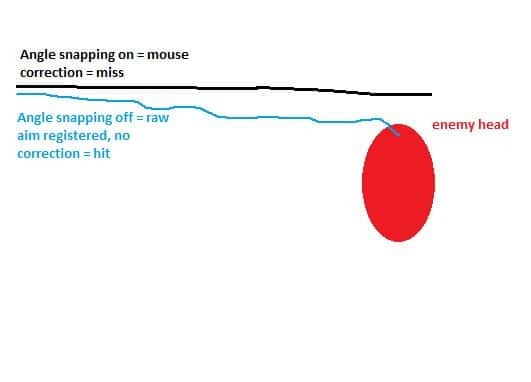 In that example the angle snapping isn’t that severe, but it does explain how, for gaming purposes, a mouse should interpret the movements of its user as cleanly as possible. Most modern gaming mice don’t have angle snapping, as the sensors which are used in the quality products nowadays are all flawless sensors, meaning that they do not feature any performance-limiting corrections such as angle snapping.